If I am here, everyone is here. If I am not here, no one is here” (Avot D’Rabi Natan, 12). It was Hillel the Elder who said these puzzling words regarding the Rejoicing of the Drawing of the Water – the ceremony that took place in the Temple area during the festival of Sukkot. Indeed, the compiler of the Mishnah declares: “Whoever has not seen the joy of Simchat Bet HaSho’evah (the water drawing ceremony) has never seen joy in his life” (Babylonian Talmud, Tractate Sukkah, 51a). Since the festival of Sukkot for is referred to as Z’man Simchateinu – the season of our joy – how can we possibly understand Sukkot without understanding joy? Usually, joy is perceived as a state of happiness, of having a great time. A universal truth of modern life is that if you want a great time, you must leave for some exotic location. Getting away from it all is so fixed in our minds that few people spend their vacation at home without feeling guilty, bad and disappointed, that they could have done something better, somewhere else. The Jewish concept of Simcha – joy is the antithesis of getting away. 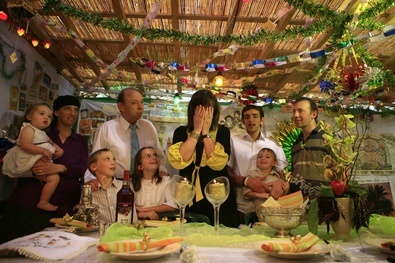 The Torah’s definition of Simcha is to be found in the commandment to celebrate Sukkot: “You shall keep the feast of tabernacles seven days… And you shall rejoice in your feast, you and your son, and your daughter, and your man–servant, and your maid–servant, and the Levite, and the stranger, and the fatherless and the widow” (Deut. 16:13-14). At first glance, there seems to be nothing overtly expressed about the “how” of rejoicing. But the Torah in fact is teaching us a sequence of joy. A person must be able to rejoice, first of all, with themselves, with their development, growth and accomplishments. Then with their family, the people who are closest to them, and finally with their community – particularly its most needy souls. For a head of a household who has all the spokes connected, the festival provides a rare opportunity to realize and appreciate what they really are, to sit back and contemplate their personal world in depth. It is specifically within this context that true joy exists and what’s more important, it can last. In addition, when one appreciates what one has, one can share it with others. A Jewish wedding is another example of this approach to joy. Instead of going off on a honeymoon, the couple don’t leave town. For seven days they celebrate Sheva Berachot, friends and family gathering for a “sacred feast,” replete with the seven special blessings recited under the wedding canopy. For seven days, the couple is the center of attention wherever they go. With this in mind, I believe Hillel the Elder’s words “If I am here, everyone is here…” means that if a person can say “I” am here – the “I” who is part of family and community, the “I” who exists in a productive relationship with the world around them, the “I” who possesses a real ego and strong self, the “I” who does not have to escape in order to rejoice – then everyone is here and everything is in order. Such an outlook doesn’t require a fancy palace. Even a fragile hut under the open skies is quite sufficient, if it houses a personality content with themselves, surrounded by loving family and friends.